The surprise visit made last night by Punjab Deputy Chief Minister Sukhbir Singh Badal and Member of Parliament from Bathinda Harsimrat Kaur Badal to a police station, hospital and power substation here. Dreaded Babbar Khalsa International (BKI) terrorist Harminder Singh, main accused in the Shingar cinema blast case in Ludhiana, had been receiving funds to the tune of lakhs from Pakistan and England besides a few other European countries. It proved to be a tough day today for the Congress Pradeshik Returning Officer, Usha Thakkar, who had to face strong lobbying from various quarters, including senior leaders, to appoint the assistant returning officers (AROs) of their choice to elect their favourites as members of the Pradesh Congress Committee (PCC), District Congress Committees (DCCs) and Block Presidents. The election process is under way in the party in Punjab. Chief Minister Parkash Singh Badal said today that he would soon meet PM Manmohan Singh and urge him to declare the channelisation of the Ghaggar as a national project, as every year due to heavy rains, it had been causing devastation not only in the state but also in the adjoining states of Haryana and Rajasthan. To strengthen its plea in the Supreme Court for lifting the stay order on the concrete channelisation of the Ghaggar, the Punjab Government is getting video filmed the widespread damage that has been caused due to the current floods in certain parts of the state. House-to-house video-filming of the damage caused due to the floods is being done particularly in the rural areas of Mansa, Sangrur and Patiala districts. The Department of Health and Family Welfare, Punjab, is in favour of the Clinical Establishment Bill as it will ensure qualified staff and quality treatment to the patients at private nursing homes and hospitals, Principal Secretary, Health, Satish Chandra, said today. Government Industrial Training Institute, Lalru, set up in 1976 to fulfil the technical education needs of the area, has been facing a serious staff crunch. Despite this, the students wishing to opt for technical education are bound to go to other cities and forced to pay hefty fees for the same course. Increasing number of dogs has lead to rise in number of dog-bite cases in Fatehgarh Sahib. Though people have lodged complaints with the municipal council authorities, but they too have expressed their helplessness in curbing the menace. Traffic bound for Ludhiana, Ropar, Jalandhar and parts of Himachal Pradesh will be diverted from 10 am to 5 pm on July 19. Bridge near Khanpur t-point will remain closed owing to ongoing upgradation of 132 KV substation of Powercom. Russian spy Olga Timoshik arrested from Jaipur used specially designed foreign software for encrypting her messages sent on internet. The revelation came during investigation of Olga’s laptop, which is supposed to contain major information and data pertaining to her activities and contacts. A 15-year-old minor Dalit girl of the Rai Sikh community, a resident of Said Jalalpur village near Dharamkot was allegedly abducted and sexually abused by two youths of her community at some unidentified place in Moga district in the wee hours on Saturday. The surprise visit made last night by Punjab Deputy Chief Minister Sukhbir Singh Badal and Member of Parliament from Bathinda Harsimrat Kaur Badal to a police station, hospital and power substation here had caught the district administration by surprise and for the whole day today, all departments concerned were busy streamlining the public grievances redressal system. The visit of Sukhbir and Harsimrat was aimed at assessing problems being faced by the public so that administrative reforms could be moulded keeping in view the requirement and aspirations of the public. 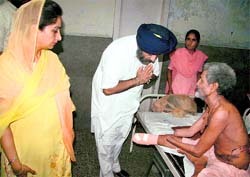 The Deputy CM’s visit led to the SSP issuing instructions for expeditious redressal of complaints, and the Chief Medical Officer, Bathinda, directing the SMO to ensure that each indoor patient in the hospital was examined by senior doctors at least thrice in a day besides streamlining the emergency working. The Punjab Power Corporation, through a separate order, made every SDO accountable for ensuring that power failure complaints were addressed promptly. The SSP, Bathinda, issued orders to all police stations in the district to ensure the expeditious disposal of cases. He said that as desired by the Deputy CM, the stolen property recovered should be handed over to the owners within two weeks of the completion of the court procedure. He said to check crime, police controlling vehicles fitted with GPS were being introduced in the city to ensure quick redressal of public grievances. The SHOs have been directed to keep each complainant's mobile number, and senior officials have been told to randomly call the complainant to check whether their complaints have been redressed timely and effectively. A complaint box will also be kept outside each police station for the public. thrice a day. The SMO will ensure that doctors’ movement register was maintained properly. cleanliness of toilets in the hospitals. The Punjab Power Corporation has also asked SDOs to keep open the complaint office from 7 am to 7 pm and keep one vehicle available to attend to complaints. A junior engineer would sit in the office from 8 am to 4 pm daily. He underwent training to use RDX in manufacturing bombs, use of hand grenades, all kinds of rifles and pistols in Pakistan. He was in touch with the BKI terrorists who were active in Pakistan. Khanna SSP Sukhminder Singh Mann stated this during a press conference. He said the accused was arrested along with three others who are members of an outfit, the Shiromani Tat Khalsa. The other three have been identified as Jaswinder Singh from Rajpura, Manjinder Singh of Hussainpura village near Rajpura and Gurjant Singh of Jangpura village near Rajpura. A case under Sections 3, 4 and 5 of the Explosive Substances Act, Section 25 of the Arms Act and Sections 17,18,20 of the Unlawful Activities (Prevention) Act has been registered against them at the city police station, Khanna. The SSP said that Harminder was a top- ranking member of the BKI and a reward of Rs 5 lakh had been announced on his head. He is the mastermind of Shingar cinema blast that took place on October 14, 2007. He had been hiding in Pakistan and Nepal and was organising terrorist activities in India after the blast in Ludhiana. The role of those who gave him shelter in Nepal, Pakistan and India is also under the scanner and a part of the main investigation in the next few days besides the source of money, fake voter ID card and possession of arms. have contacted us or lodged a complaint in this regard. Nobody came forward to meet me or any other senior police officer in this regard,” said the SSP. He said the other three were active members of the Shiromani Tat Khalsa and Jaswinder Singh was one of the five top leaders of the organisation and they were involved in the protest against holding Divya Jyoti Jagran Sansthan function at Ludhiana in December 2009. They were involved in blasts at Ambala on April 13, 2010, and on April 21, 2010, near Sat Narain Mandir in Patiala. Three kg RDX explosives, four detonators, four timer devices along with a fuse wire, two empty pipes to be used for making bombs, one AK-47 rifle with 50 cartridges, one .30 bore pistol with 68 cartridges, 2322 US dollars, Rs 57,000 in cash and a fake voter ID card in the name of Baljit Singh was recovered from them. The police officials said the informer who gave them a tip-off before the arrest of these terrorists would be rewarded Rs 5 lakh and his identity would not be disclosed. Cops who worked hard to nab the accused would also be rewarded by the DGP. The arrested terrorists have been sent to police remand till July 24. Thakkar, who is camping in a room of Chandigarh’s UT guest house, which virtually turned into a Congress bhavan today, has been give the task to conduct organisational elections in Punjab by the All- India Congress Committee (AICC). Some senior Congress leaders, who have high stakes in the election, strongly objected to the appointment of AROs of the choice of party MLAs and MPs. They claimed that they had enrolled more members than the party MLAs and MPs in their respective areas and hence there should be polling to get the PCC, DCC and Block Presidents elected and the exercise to appoint AROs of the choice of MLAs and MPs should be done away with. Sources said two AROs of each MLA’s choice had been appointed. The same benefit had been given to the party MPs. That means that MLAs and MPs would dictate terms in the organisational elections and get PCC, DCC members and block presidents of their choice elected. Non-MLAs and non-MPs had been put to great disadvantage. There are about 44 Congress MLAs. From each MLA’s constituency two block presidents would be elected. In other words, straightaway 88 block presidents of the choice of MLAs would be elected. As there are 117 Vidhan Sabha constituencies, 234 block presidents are to be elected. From each party district (including rural and urban), six DCC members are to be elected besides one PCC member. Thakkar said she would not succumb to any pressure and would conduct the election in a free and fair manner. She said she would like that all block presidents, members of DCCs and PCC were elected unanimously as voting would not be in the interest of the party and create disharmony among party ranks. Moreover, conducting the polling would prolong the process. She said a due consideration had to be given to the opinion expressed by party MLAs and MPs in the organisational elections. After reviewing the progress of relief operations in the flood-hit villages of Patiala today, Badal said: “The government will take up the issue of immediate upward revision of norms for the calamity relief fund with the PM and the Union Home Minister. It will also urge the Centre to raise the quantum of compensation, especially for the damaged crops, from Rs 1,600 per acre to Rs 10,000 per acre.” Blaming the Haryana Government for the floods, Badal said the construction of the Hansi-Butana Canal had flooded the state and caused substantial damage worth Rs 350 crore. He also accused the Centre of giving approval to Haryana for the construction of the canal despite opposition by the Punjab Government. Referring to the proposal of former state CM Capt Amarinder Singh to accompany him for pressing for a special relief package from the PM, Badal said he was ever ready to accompany anyone barefooted for the genuine and justified cause of the state. Meanwhile, Badal directed Financial Commissioner (Revenue) Romila Dubey, who accompanied him today, to immediately release the payment of the calamity relief fund to the DCs concerned so that the repair of damaged public installations and infrastructure was not hampered. He has directed the PWD (B&R) to repair the damaged roads, besides instructing Punjab State Power Corporation Limited to restore power supply which was interrupted due to the recent floods. The CM also listened to grievances of the flood-hit victims. TNS adds from Sangrur: Chief Minister Parkash Singh Badal today visited the Moonak area and the stretch of the Moonak-Tohana state highway to review the flood situation. Addressing mediapersons, he said Rs 15 crore had been sanctioned for the restoration of the damaged infrastructure in Sangrur and for compensation to affected farmers. To strengthen its plea in the Supreme Court for lifting the stay order on the concrete channelisation of the Ghaggar, the Punjab Government is getting video filmed the widespread damage that has been caused due to the current floods in certain parts of the state. 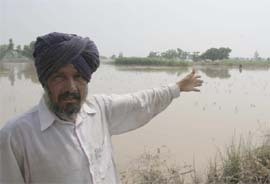 House-to-house video-filming of the damage caused due to the floods is being done particularly in the rural areas of Mansa, Sangrur and Patiala districts, where the Ghaggar has damaged standing crops and other property. Privately engaged videographers are going house to house in the Sardulgarh area and recording statements of the farmers, whose crops and other property have been destroyed. They are also filming waist-deep floodwater that is standing in cropped fields. Hundreds of tube wells have got submerged in water. Relief operations by the Army, ITBP and the National Disaster Response Force (NDRF) have also been filmed. A senior government official said videotapes might be produced in the court to bring to its notice the damage caused due to the stoppage of the channelisation of the river. Preliminary estimates indicate that crops on over 3.25 lakh acres have been destroyed due to the floods. Badal today visited flood-hit villages of the Sardulgarh subdivision of Mansa district to assess the extent of damage and relief and rehabilitation measures. He visited Sardulgarh town, Kanewala, Sadhuwala and Phusmandi where widespread damage was caused due to the floods. He said seeds of late sowing varieties of crops would be given to farmers, who had suffered agricultural loss. He was in the city to attend a state-level meeting of the Punjab Chemists Association. The secretary also said the Cabinet sub-committee was already convening meetings over the Bill and the issue would also be discussed in the coming Assembly session. The report about the same would be sent to the Centre, he added. Meanwhile, Punjab Health Minister Laxmi Kanta Chawla, while addressing the meeting of chemists, held them responsible for the rampant increase in the sale of habit-forming drugs. “The way female foeticide can't be carried out without the help of the doctor doing the ultrasound, similarly people can't get drugs straight from the manufacturers but they are made available to them by chemists. It is rather shocking that till date not a single chemist in Punjab has come forward with a complaint against the culprits responsible for selling habit-forming drugs to people,” the minister said. The minister also expressed resentment towards the manhandling of the department staff in raids conducted at chemists selling habit-forming drugs without bills. According to sources, there were 12 staff members when this ITI was set up and even today the institute is functioning with only 12 staff members. Some staff members told that there was need of 19 instructors for different trades, but presently nine instructors have been managing the work. Along with the shortage of the teachers, vacant posts of the clerical and other staff has also affected the functioning of the ITI. The institute needs one instructor for draftsman civil, one for electrician, one for motor mechanic vehicle and 10 instructors are needed for different courses of the centre of excellence textile and processing technology. To fulfil the teaching needs, many teachers have been working on the basis of guest faculty, the ITI authorities informed. Interestingly ITI, Lalru, has been selected for instructor training wing from the side of Punjab. Around 10 ITIs were selected from all over India for the purpose. But only 12 staff members have been working for the purpose of instructors training wing. Moreover, same staff was also helping for the women ITI, Dera Bassi, which was being functioning in the building of ITI, Lalru. This ITI also faces the shortage of other staff as two posts of clerks, one post of superintendent, six posts of workshop attendants, two of chowkidars and one post of sweeper are lying vacant. Meanwhile, Rakesh Verma, who has the additional charge of director, technical education, Punjab, admitted the lack of staff in ITIs, but he could not inform the exact number of staff shortage. Additional director of the technical education Daljit Kaur said staff would be recruited when the government provided permission. “Neither can we kill the dogs as a law in this regard came into force, nor can we sterilise the stray dogs due to the shortage of the funds. Thus, the number of such dogs is on the rise,” said Bassi Pathana Municipal Council president Kulbhushan Malhotra. The other Municipal Councils at Mandi Gobindgarh and Sirhind too have not initiated any action in this regard, he said. The area residents rued that the stray dog menace has lead to increase in the dog-bite cases. “Neither the MC has initiated any action in this regard, nor the civil hospital authorities provide medicines to the patients,” said Tirlok Singh, a resident of Sirhind. Patients of dog and cat bite now make a beeline to the government and private hospitals at Chandigarh, where the treatment is very costly. Some patients, who underwent treatment from various private and government hospitals in Chandigarh, rued that now anti-rabies medicines were administered as per the weight of the patients, which are too costly for the poor patients. “Rise in the number of stray dogs is witnessed in every locality of the city. Problem is acute near the carcass dumping ground or adjoining the garbage dumping grounds,” said Mehar Singh, of Preet Nagar locality. The patients, who underwent the treatment, said the number of patients in the government hospitals is too high that doctors fail to provide proper treatment. They would simply ask to undergo treatment with the injections. A person weighing 60 kg needs to shell out Rs 5,000 to 15,000 after a dog bite, though doctors also prescribe some cheap medicines ranging from Rs 300 to Rs 450, which were not considered as potent. Chief medical officer at Fatehgarh Sahib civil hospital Reena Sandhu said senior medical officers in the civil hospitals of the district have been told recently to arrange these medicines of their own since they have not received the supply of anti-rabies vaccine for the past long time. Cost of these medicines is between Rs 300 to Rs 400, she said, adding that she was not aware of any costly medicines recommended by the doctors. The work of installation of high tension wires over this stretch will be carried out from 10 am to 5 pm leading to complete blockade of traffic on this portion of National Highway 21. Traffic bound for Himachal, Jammu and Kashmir, Amritsar, Jalandhar, Hoshiarpur and other parts of Punjab as well as that coming from Chandigarh, HP, Delhi and Haryana will remain affected. Russian spy Olga Timoshik arrested from Jaipur used specially designed foreign software for encrypting her messages sent on internet. The revelation came during investigation of Olga’s laptop, which is supposed to contain major information and data pertaining to her activities and contacts. “The person, whom this message is sent, alone can decipher it using a decoding software,” the police officials pointed out. The police was trying to decipher the codes and know more about Olga’s activity. Interestingly, Olga has been repeatedly changing her identity in statement before the police. First she claimed herself to be a freelance journalist, then a photographer, dealer in resplendent gems and now, the record of Olga’s Jaipur bank account revealed a new identity. “In her details to the bank, Olga has claimed herself to be in textile business. The Ropar police had approached Jet Flight India Limited, Jaipur, whose tickets from Delhi to Kathmandu were found from Olga’s house at Jaipur. While one ticket was booked in the name of Thomas Keuhen, other was in the name of Laura Timoshik, but company’s voucher bears phone number of Olga. “This means that Olga has even distorted her own identity,” the police officials pointed out. The police also got a call detail report of Olga’s mobile, which stated that she frequently talked to a person named Sergy. The call duration of 15 to 20 minutes appeared in a pattern of four to five calls per week in the CDR. Meanwhile, Olga’s bail plea would come up for hearing at the Ropar court tomorrow. After sexually abusing the girl, the culprits threatened the victim and her parents but the daring girl persuaded her parents to report her tragic tale of woes to the police. She and her parents approached the local police and stated that she was abducted and sexually abused by two youths, identified as Lakhminder Singh, son of Bhagwan Singh, a resident of Chak Bandala village of Jalandhar district, and the other one, Goli, son of Baru Singh, a resident of Bet Bandala village, also of Jalandhar district. She stated that both of them put a piece of cloth in her mouth and forced her to sit on a motorcycle. They took her to an undisclosed location and sexually abused her, she added. Then, they left her on the link road of her village from where she came back home on a bus. The medical examination of the victim was conducted in the district hospital here, after which it was established that she was sexually abused, on the basis of which, the police has registered a criminal case against both culprits in Dharamkot police station, last night. The investigating officer, Inspector Swaran Singh, said the police had managed to arrest Lakhminder Singh while the other accused was still eluding arrest at the time of writing the report. The father of the girl alleged that he was still receiving threats from the associates of Lakhminder.